This Freesat installation guide is based on the Humax FOXSAT-HDR receiver and PVR, installation settings may vary. 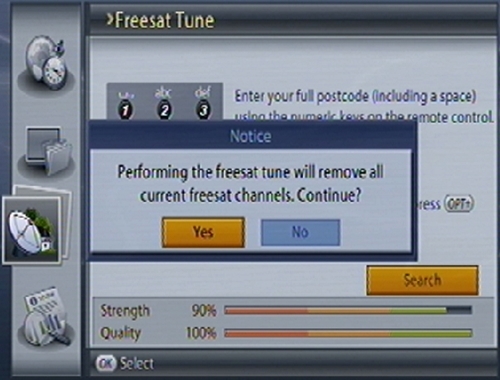 When turning on the Freesat receiver for the first time, the First Time Installation will appear. The default password is 0000. 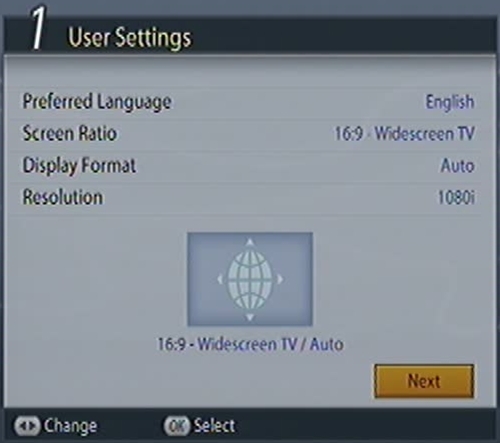 User settings allows you to set the language, screen ratio, display format and resolution. select NEXT and then press OK on your remote. Not all resolutions will be available, this depends on the type of connection you use and on your television. If the product is connected to the TV using an HDMI cable, Original will not be displayed. 1. Confirm the antenna cable(s) are connected and press the OK button to find Freesat. 2. Wait until Freesat detection is complete. 3. 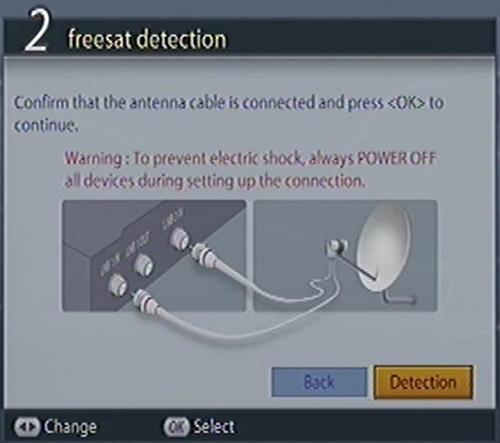 When Freesat is detected, press the OK button to go to the next step.If Freesat is not detected, check your satellite antenna cable connection and that your satellite dish is aligned to the Astra 2 group of satellites and Eutelsat 28A, positioned at 28.2°/28.5° East. Always turn the receiver off at the mains before checking the antenna cable and connection, failure to do so could result in permanent damage to your receiver and Electric Shock. The Antenna signal is detected. 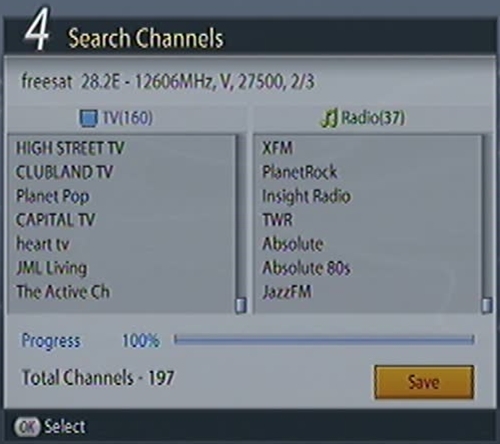 The Freesat+ receiver is now searching for Freesat. This should take no more than two minutes. If no signal is detected, check your dish and cables. A Direct Cable connection has been detected. This is a single cable installation. Freesat+ receivers have two independent LNB inputs, allowing you to record programmes while watching another. An LNB with more that one output is required. The receiver will automatically check for software updates. 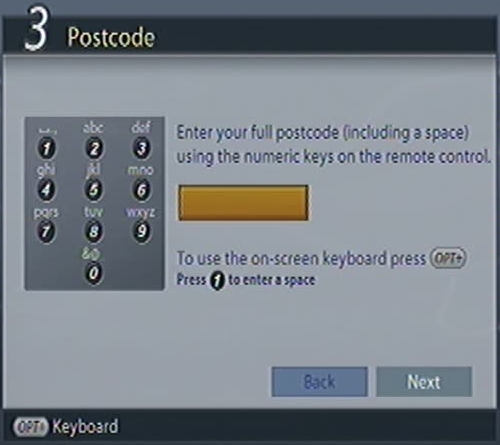 Enter your full postcode (including a space) using the NUMERIC(0-9) button on the remote control. To use the on-screen keyboard, press the OPT+ button. Press the 1 button to enter a space. NOTE: You must enter your entire postcode including the space. 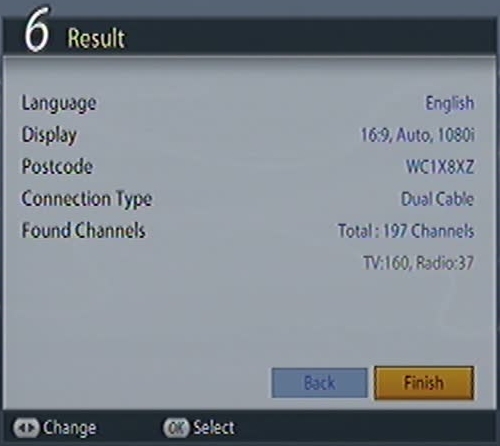 You can always change the desired postcode in the Freesat installation menu by changing the postcode. 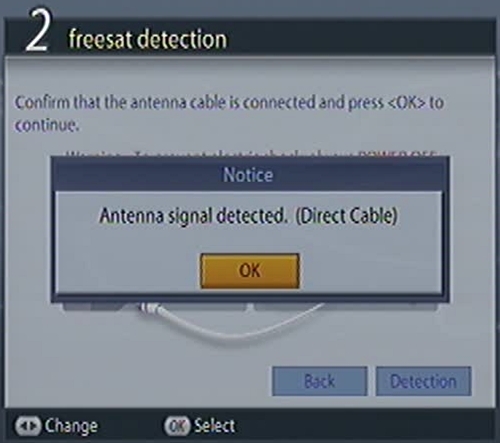 You must rescan in Freesat mode and then save for the changes to take affect. All English & Welsh postcodes will also include ITV London on channel 977. 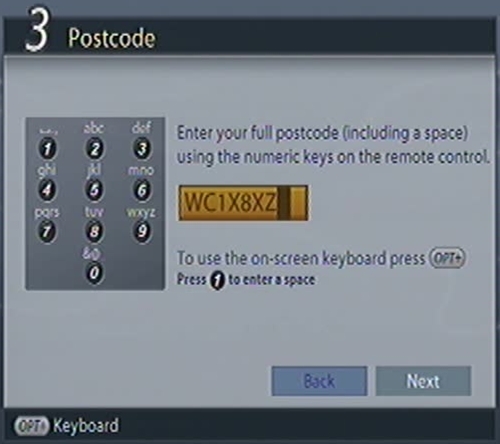 You can use any postcode with a Freesat receiver, allowing you to watch any regional variations from the BBC and ITV. 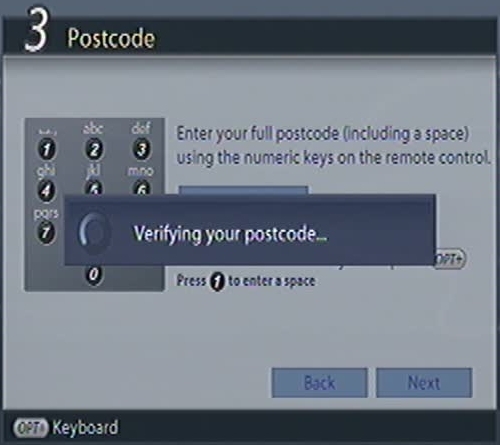 Freesat will then verify your postcode. Overseas reception & Postcodes Outside the official UK spotbeam footprint, reception of your default region may be difficult. Apart from some local variations, the BBC’s and ITV’s programming is more or less identical in all regions. Some regions use horizontal and some vertical transponders. Signal strength from horizontal and vertical transponders varies considerably from country to country, so your default region may not give the best reception in your area. The postcode can be changed to any UK postcode, though you will need to do a Freesat tune, all current channels will be deleted. Once the postcode has been confirmed, you are ready to carry out a Freesat channel scan, press Search. Search Channels will be activated and the results will appear. To stop the channel search, select Stop and press the OK button. Select Save and press the OK button to go to the next step. This search only saves channels currently available through the Freesat Electronic Programme Guide (EPG). 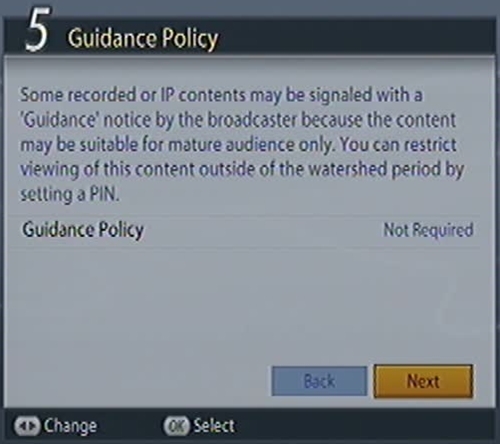 To add other channels, you must do a Manual Tune. Save the results, this will be complete when the blue saving bar reaches 100%. The installation will then continue to the final completion page. 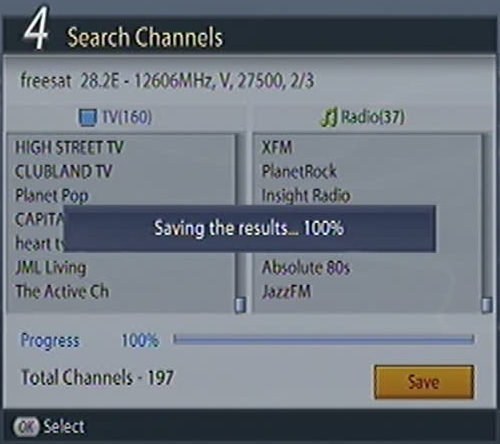 The Freesat search is being saved. Freesat receivers provide a guidance Policy option, this can restrict viewing of Adult content, by requiring a PIN to enable viewing. This displays the options chosen, such as language, screen resolution, your postcode, connection type (single or Dual cable) and the number of TV and radio channels found. NOTE: Most of these options can be changed in the Freesat+ menu. The number of channels listed only pertains to those currently listed on the Freesat Electronic Programme Guide (EPG). 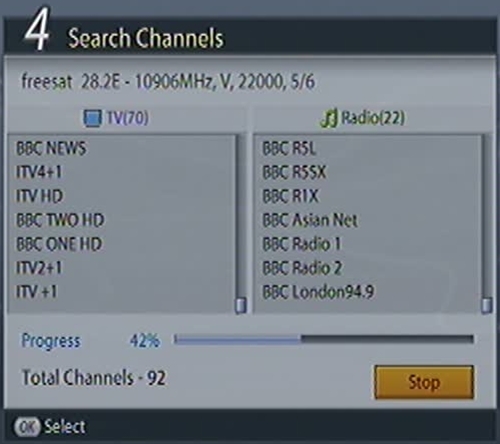 Many more can be viewed on the receiver by doing a MANUAL SCAN, then viewing in Non-Freesat mode.